Welcome to another house tour in the month of February! I am enjoying these so much I may extend this year round to keep me inspired. This house tour is especially fun for me to share because it belongs to my favorite neighbors, the Burch family! Rachel agreed to letting me come over and take photos of her house a few days before Valentine's day when the ground was still covered in snow and they were keeping busy as they awaited the birth of their son. I had all of the photos edited and ready to post last week when I remembered I hadn't e-mailed her the interview questions! I sent her an e-mail about it last Friday (although I still forgot to attach the questions) and the next thing I heard back was that she'd had her baby early the next morning! How that all went down is another beautiful story in itself. Rachel graciously sent me over interview questions that she hand wrote while staying with her son in the NICU this week. They're hoping to bring him home in a few days and we are so eager to meet the little guy! I hope you enjoy this peek into the beautiful home of the Burch's. Q: How would you describe your interior style? A: If I had to define it in one word I'd say 'uncluttered'. I believe we have too many people living here to have a bunch of stuff just sitting around taking up space. I love to follow the old rule of having nothing in your house that you don't use often or absolutely love. Q: What has most influenced your style? A: My parents have always enjoyed decorating their home and they change things up often. Although they have very different taste than me, I think I inherited a love of styling my space from them. I also happen to be surrounded by friends who have incredible taste and beautiful homes. I think that's where I get most of my inspiration. Q: When did you start having an opinion about your home decor? 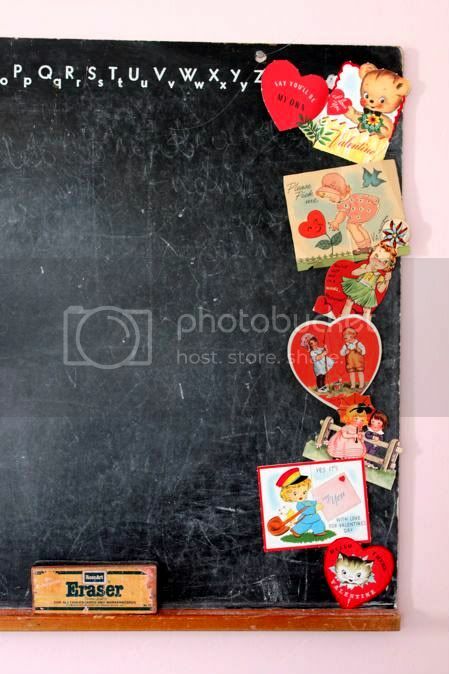 A: I can remember ripping off the ugly pink bow wallpaper in my room when I was in 7th grade, without my parents' permission! I then redecorated in a hunter green/maroon color scheme that I thought was awesome. Keep in mind this was 1993! Q: Which is your favorite room? Why? 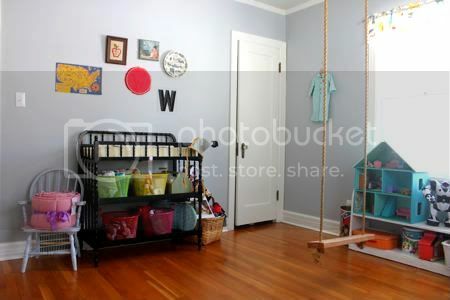 A: Right now, I'd say Walter's room/the play room. Maybe I'm just being sentimental since I can't wait for him to come home and put it to good use. 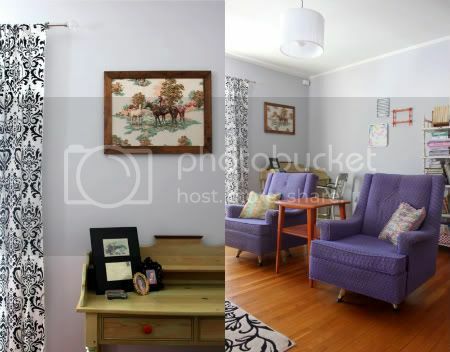 I love the swing, the hand-me-down vintage furniture, and the circus curtains I scored on eBay. Q: Do you feel like your space is working for you or have you had to adjust your expectations of perfect? A: I feel like this house is pretty close to perfect for our young family. Having 4 children in one room wouldn't work for every family, and it probably won't be ideal as they get older, but for now it works very well. We have a large back yard, a dining room that seats ten so we can entertain, and a room in the basement that serves as a family closet. 2,300 sq. ft. might not sound like a lot for a family of 7 but it works for us. Q: Where is it all from? A: Flea markets, garage sales, craigslist, eBay, Ikea, and hand-me-downs from family. Our only splurge was the leather couch from a department store. With all of these kids, we needed a durable seating option. Q: What do you have your eye on that you hope to own some day? A: As far as furniture goes, I'm very content with our hodge podge of bargains and hand-me-downs. I do look forward to the day when I can afford some amazing fabric for curtains, bedding, etc. Q: People are coming over! What do you tackle first? A: My kids are actually old enough that with their help, we can get the house looking decent with only a few moments notice. They put their toys away while I sweep the floors. I've been enamored with the Burch's home ever since she first invited me in and gave me a new neighbor tour! 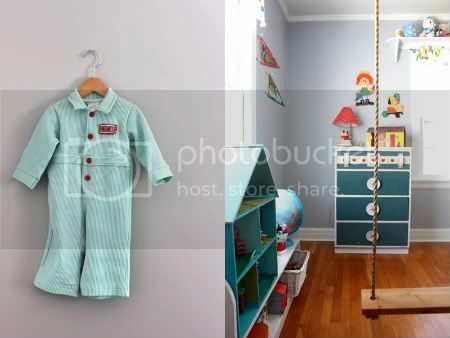 She's got beautiful vintage touches in every room and that rope swing is Sebastian's favorite thing in their house! He has actually told me he wants to live there! Thank you, Burch's, for letting me invade your home so close to Walter's birth. We're all so excited that he's finally here and are looking forward to him coming home, too. And I'm going to schedule a play date so your kids can teach mine how to get the place ready for company! What a beautiful home! It's really lovely--I'm a fan of the way Rachel uses lots of white spaces but still makes everything incredibly colourful with bursts of bright accessories. And that fuschia wallpaper! It's my neighbor's house, not mine and yes it's beautiful!!! Wow! Rachel's home is so lovely! How charming. Adorable, too! I love how crisp and fresh this home is! This is what I wish I could do with my house, but will never happen. I'm too cluttery and disorganized by nature. I absolutely love this house! amazing colors, everything just magically works without being over the top. very well done!! Very pretty, my husband would never go for all that pink and purple but I love it! oh i love your neighbor's home! everything and every room is beautiful! What a CUTE house. I love it and love the colors, too. What an absolutely amazing home! And I love that it feels comfortable... I feel if she was my neighbor, I would have no problem coming in and feeling at home to have a cup o' tea. I do have a question for Rachel or your other readers... for those of you who have done flooring similar to Rachel's kitchen, what or who have you used? Did you diy? This is the most beautiful home I think I have seen in a really long time! I wish I cold move in! You had me hooked with the very first picture! 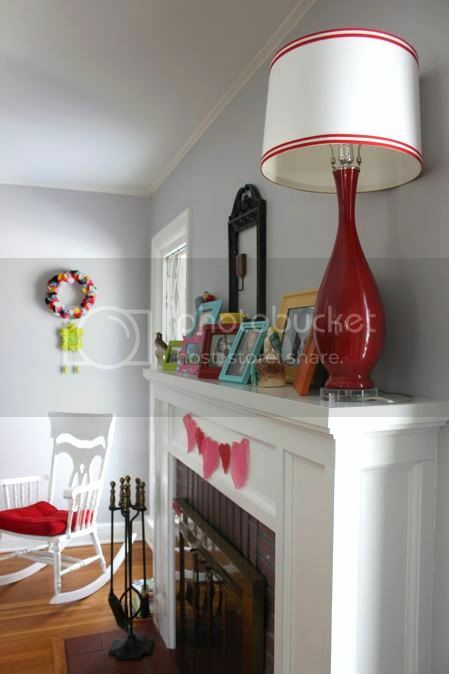 Love the different colored picture frames on the white mantle. Just lovely. What a fabulous house! I LOVE the decor and all the fun painted walls. I am going cuckoo over the cuckoo clock, the red wicker chair and that over-the-top pink damask wallpaper! WOW! Her house is officially my dream home!!! I have four kids and my house is the same size as hers but it's drab and so...um, basic builder boring. One question, do they own it or rent? 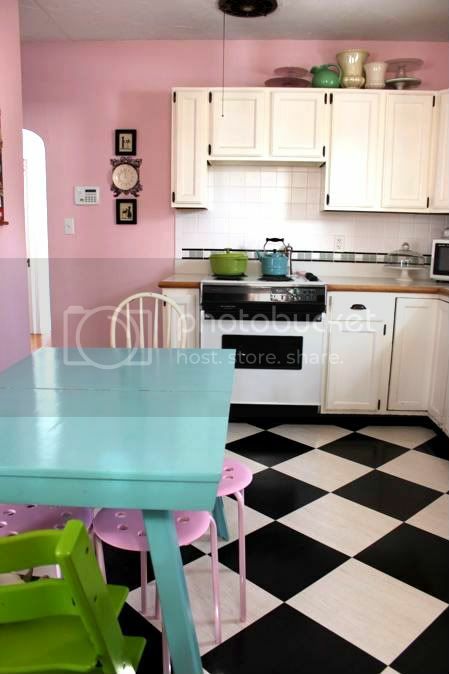 I just ask because of all the wonderful wall colors and the kitchen is divine, so I assume the ownership. Hard to do such funky fun things when you rent. Sigh. I'm in love, thanks for sharing!! Really cute, colorful house! 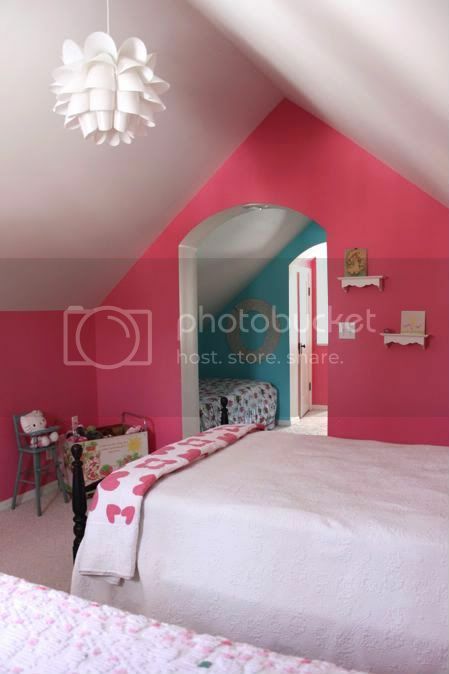 I'm dying over that pink wallpaper in the hallway. That is SO gorgeous!!! Such a beautiful home! I'm a fan. 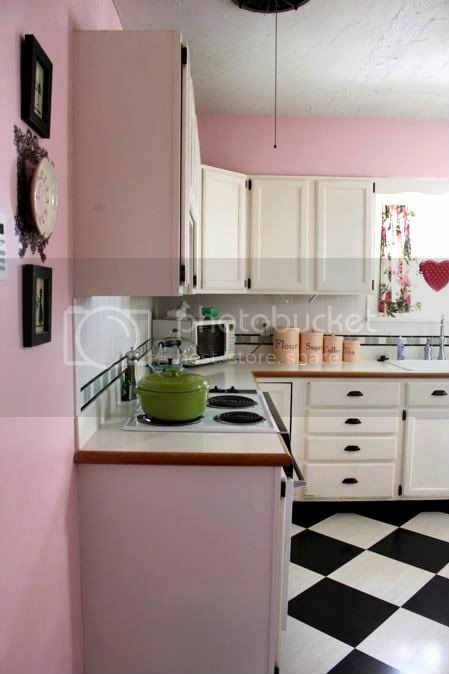 okay, that pink kitchen? really? love it. I wish I could talk my husband into that!!! Wow!! It's lovely! :) It's so streamlined, but the pops of color give it a ton if personality! the cuckoo and the pink wallpaper are my faves - thanks for the inspiring tour!! Oh my gosh, that house is GORGEOUS!! I want to live there, too. LOVE the colors - thanks for sharing! seriously fun and beautiful home. 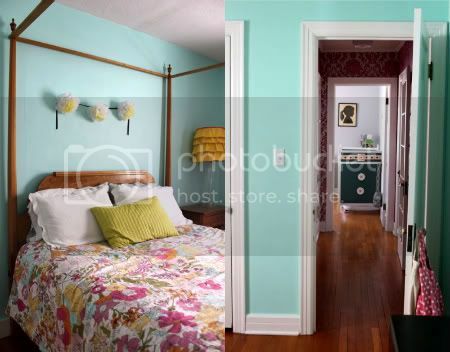 i love her whimsical style and the wall colors. and i love the simplicity! Not only is her house flawless, impeccable and adorable....Rachel Burch herself has an endearing personality that is incomparable in quality...highly principled, honest, loving and bursting with creativity and stamina. Thank you so much for featuring her, Rachel. We love her...and we love your blog! Thanks for sharing! She has a great house with lots of cool finds. OH MY GOODNESS. That is an awesome house. I love how they can fit 4 beds in that room. 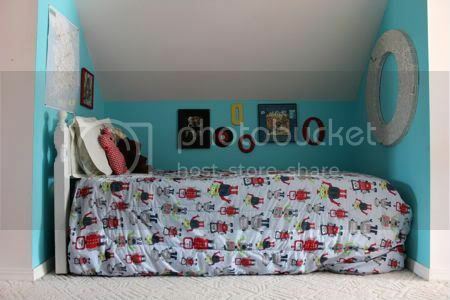 It seems like there's enough privacy for each kid that it doesn't even seem like 4 beds are in there! WOW i'm amazed!!!! i love all the great pops of color everywhere, and i applaud this mama of... 5? did i read that correctly? for being so on top of things and keeping the place looking Spontaneous Guest Ready!!!!! i love this new feature, rachel! so inspiring! ps... 5 year old giggles, my word verification is poope! So beautiful and creative. I love all the color! What a lovely home. Amy: your comment is epic! So well written & you couldn't have been more right! Great questions and I love the photos. I would love for my home to look like this. Love all the color. I just need to know how to start. Thanks for sharing this. Amy's right! We love Rachel! If there's a good quality, she's got it! She's definitely got it goin on! She's truly amazing with the most incredible house EVER!! How cool that this is your neighbor! Y'all have so similar tastes I'm sure you have become great friends! OH this has made me want to completely start over my house!!! 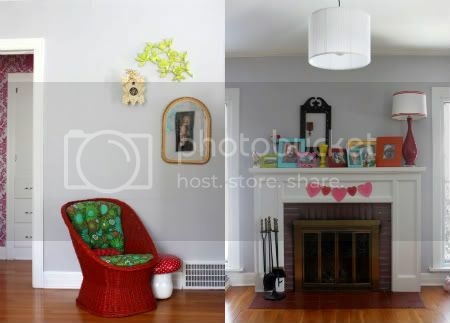 Oh wow, your neighbor's home is so full of color - I can't get over how every room pops and is so perfectly coordinated! One day I would love to have a black and white checkered kitchen floor - it's one of those things I've always lusted after! Her house is amazingly sweet, just like her! What fun to be one of her kids to grow up and play there. I love everything about it! aw, i love rachel and her sweet family! i remember the first time skyler took me over there for a tour of their house. matt had a kiddie swimming pool set up in the basement and oliver was playing in it! it was so cute. this is such a fun feature, rachel! this house is absolutely gorgeous! What a lovely home tour! I love Rachel's "less is more" mentality. Truly inspiring. holy mackerel! i love this house! i only have two children and toys are everywhere... (i am working on that + plan to get totally organized soon), but i love the 1st photo of the wreath, and that green cookoo clock reminds me of my grandma! Wow! It's like eye candy! I'm in love with everything...all the brilliant colors and fun decor. Thanks for sharing! Wow that house is amazing! Fantastic! Aww what a gorgeous house! 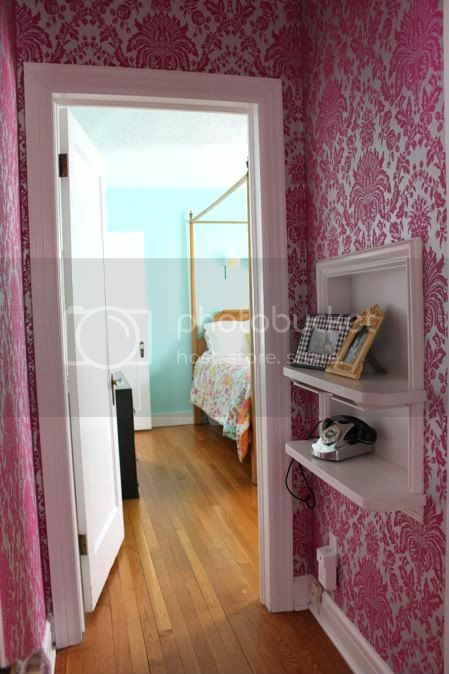 I love the damask pink wallpaper the most. I keep thinking about this house and all of its pretty touches. I really want to make some of those wreaths. Thanks for sharing it! Wow, this house is my dream home!! Love it. Is there a way we can get a list of paint colors for the room?? I know a mom of 5 is probably crazy busy...but just in case??!!? Congrats on your new baby boy...neighbor Rachel! how stinkin cute! i love this! 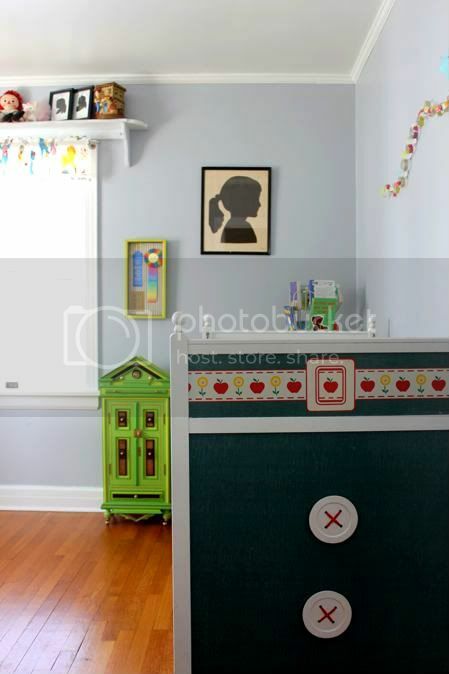 I stumbled upon your blog via Apartment Therapy and I'm totally loving it...especially this house tour! What a great house and congrats to the family for the new addition! Thanks for all the kind words! They've just made my week! The kitchen floor was here when we moved in so I'm a bit clueless as to how to install one. As far as paint colors goes, we painted when we moved in 4 years ago. I should have written down the color names but I failed to, sorry! Another visitor from Apartment Therapy here- your house is darling! 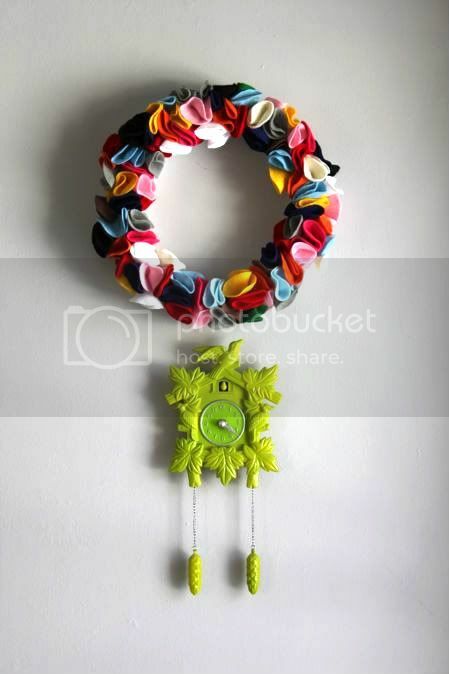 Did you make the felt wreath above the cuckoo clock? I love it- if you ever have time to share a tutorial I'd totally check it out! Another visitor from Apartment Therapy here- your house is darling! 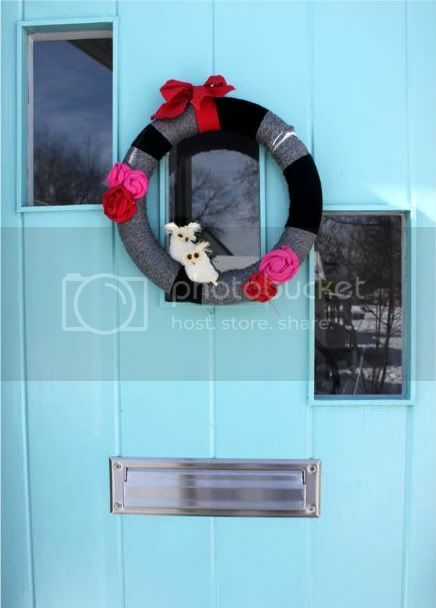 Did you make the felt wreath above the cuckoo clock? I love it- if you ever have time to share a tutorial I'd totally check it out. Thanks for sharing your home! Your house is very sweet. Thanks for letting us take a peek.